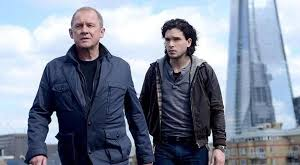 I loved the TV series Spooks, so I was quite excited to see the trailer for the film Spooks: The Greater Good. It lived up to expectations, and as it has only just come out, I won’t give any spoilers to the plot. The film was fascinating as there were so many levels of deception, with so many plot twists and turns. It kept us guessing right until the end. One interesting issue was the ethical dilemmas faced by operatives: should they follow orders or follow their conscience? I guess, just like in the military, they make promises to follow orders as part of their job description. There is no clear-cut answer to this in the film. One of the characters says something to the effect of, in MI5 you can either ‘do good’ or ‘do well’, which got me thinking about whether most people would be prepared to make ethical compromises in order for career progression. I realise this may sound like a naive pondering, but I’m thinking ethical compromise on the scale presented in Spooks, like ending someone else’s career, health or even life. I suspect the answer to that one would be an emphatic no! for most people – but is the spy business any different? Hopefully much of it is fantasy! I wouldn’t like to be in a job where I had to make life and death decisions like that. A lot of these key decisions fall to Harry, who we have come to know and love over the 10 series of Spooks. The film also dealt delicately with the issue of terrorism. It presented the main terrorist ring-leader in a sensitive way, clearly showing the reasons for his hatred of the country, and in particular the spy services. The story was fairly believable. It also separated the issues of terrorism and religion, which I think is key. The terrorist ideology was not shown to stem from religion, but from hatred stirred up by the actions of spy agencies and governments. This, I feel, is the greater good of the film!